Sometimes it takes a moonshot goal to make real change -- like three to five years to make Silicon Valley corporations as diverse as the communities in which they operate. It's doable, says Emmett Carson, CEO of the Silicon Valley Community Foundation. "All of the new jobs are not just software jobs. They're not just tech/science jobs. If you work at one of these companies, there are HR position jobs, there are advertising jobs, there are legal jobs from mergers and acquisitions. There are marketing and communications jobs. And those are jobs where there are deep resources of talent in communities of color." The man at the center of the Silicon Valley corporate philanthropy world may just be on to something with his mix of big goals, lobbying efforts, local community initiatives, and whispers into the ears of wealthy and influential corporate execs. Carson continues: "There is no reason why a concerted effort couldn't make substantial change over three to five years ... And it can be done without causing undue turmoil." He believes there are plenty of quick wins to be had, and it doesn't even require solving the pipeline problem. All it takes is real commitment from the C-suite. Silicon Valley Community Foundation is no podunk foundation. It counts some of the valley's biggest companies as donors, including eBay, HP Enterprise, Symantec, LinkedIn, Microsoft and SAP. Last year, it gave $821 million in gifts. Carson proposes that instead of looking to innovate, companies look to the past. If a company makes a big public commitment and stands by it, we can solve the diversity problem in tech. Take Ford: "There was a time at which Ford Motor Co. wasn't very diverse," Carson says. "They made a concerted decision that they needed to be different." And it worked. Indeed, in the 1920s, Ford was the largest employer of African Americans of any automotive company. The first collective bargaining agreement in 1941 explicitly prohibited discrimination based on "race, color, national origin or creed," and Ford hired its first African American senior manager in 1950. "[Ford] did it in a structured way. They said: 'It's good for our business. We ought to be reflective of America.' And they made it happen." In fact, taking the approach of prioritizing change isn't just a feel-good thing. It's a matter of responding to customer demand and heeding the call of competitive advantage. There is a true market argument in favor of diversity. Just look at Google's automatic image recognition software that worked perfectly until it was found to be misidentifying black people as gorillas. Get that straight. They launched a product to the public with that egregious error. Google's mea culpa called it an unintentional algorithm glitch. While the mistake was not intentional, had people of color been on the coding team -- or even in the room -- it never would have happened. Hidden bias led coders to forget that skin color and facial features vary among the human population. Accident or no, it was inexcusable, And it cost Google money, hours of PR and rush jobs on the coding side to fix the problem. Without diversity, "you're losing money in the marketplace," Carson says. "We had uncovered that systematically across the state, black and Latino children who passed their 8th grade math tests were being required to repeat the test in 9th grade." "One, it completely demoralized the kid who had performed. Second, it meant that the kid was now off track and unlikely to complete the math requirements so that they could enter a California state university ... In addition, it meant that their lifetime earnings and the earnings of their family would be forever diminished." The policy tackled a loophole in the system that allowed teachers to subjectively hold students back. A legislative fix like this won't make a quantitative difference for some time. But it can make obtaining a high school diploma and going on to college just a little bit easier for a population that already faces a head wind. SVCF has even gone extremely local to help support the owners of RVs that have made the street behind the SVCF office their permanent home. "It's just heartbreaking, and we're working with the city to both provide housing and social services. It's disappointing for me to say this, but it's necessary: [We've facilitated] ... portable showers ... I don't say that with any pride, 'Oh, wow, pat us on the back. We're helping to get portable showers.' That's a stopgap for something that shouldn't be acceptable in one of the wealthiest counties in the United States and in the world." But the showers and social services SVCF arranged to provide do make a real, measurable improvement in the lives of people living permanently in what should be temporary homes. 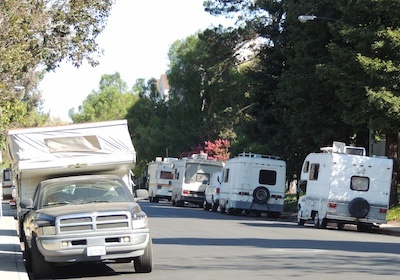 Addressing Silicon Valley's housing crisis has become a key priority for SVCF. "The community foundation's principle is that every community should have a home for every job in that community. Whatever job is generated that's needed in that community, there ought to be an affordable home for the salary." It doesn't seem like too much to ask, but as we learned in our series last year on social inequality in Silicon Valley, housing is a huge issue for the entire region. Carson advocates for building up not out, to increase density and therefore supply on the peninsula, and a state or regional mandate to overcome the not-in-my-backyard issues that currently keep cities from zoning for new housing. When Carson talks about housing, he makes it clear that it's not homeless or low-income housing he's fighting for, although those are important too. "We have $100,000 software engineers who have to have roommates -- not by choice, but because of the housing market. That is not sustainable, and if we don't address that, it will corrode our entire community's success." The complicated issues of economic and racial inequality are difficult to unravel; and solutions must come from every angle too: corporate leaders, policy updates, and even modest efforts like our own Black Lives Matter and Beyond series. Each little effort to address economic inequality and educate ourselves about implicit biases and our own individual efforts to address them can bring about massive change -- as long as we work together.